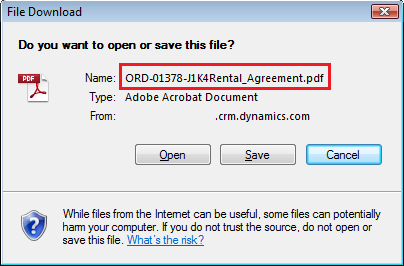 Did you ever want to build a report in Dynamics CRM and download it in PDF format without having to manually rename the file? This is one of those things that makes a difference from the end user perspective since it streamlines the process – there is no need, anymore, to go back to the underlying record and copy-paste information from some of the fields to the file name. Unfortunately, even though it seems reasonable, this feature is not supported out of the box. Moreover, Dynamics CRM uses SSRS for reporting, and, to the best of my knowledge, SSRS does not support this feature either. This is not to mention that we have limited control over SSRS functionality when working with Dynamics CRM in general and with the online version of Dynamics CRM in particular. We can make it work, though, and you will find step-by-step instructions below. Please keep in mind that this solution uses some of the undocumented java script SSRS-related objects which may or may not exist in the newer versions of Dynamics CRM. As of now it works, though, and, I believe, all those undocumented features (there are really just one or two) will be available in the future. 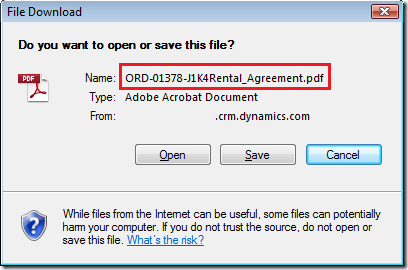 We want to be able to name the file automatically as part of the “Export to PDF” step. We will do it using “salesorder” entity as an example, but it is easy to do the same for other entities as well. We will create a java script that will be loaded as a web resource to the order form. In that java script, we will define a single function that will be called in form “onload”. That function will re-define window.open so that we can run additional code whenever user decides to build a report. Our additional code will use java script setTimeout in order to wait until the report is loaded, and, then, modify report file name. We will be using undocumented features of Dynamics CRM only once: in order to modify the file name, we will have to access java script instance of the reporting component. I believe this part of Dynamics CRM functionality is not really documented, but one can always use Internet Explorer developer tools (F12) to do some research. First, we will forward that request to the original window.open. After that, we will verify if requested url contains “viewer.aspx” substring. If it does not contain such a substring, we don’t need to do anything. And that’s, pretty much, it.